Amazon Price: $5.99 $5.99 (as of April 18, 2019 8:51 pm – Details). Product prices and availability are accurate as of the date/time indicated and are subject to change. Any price and availability information displayed on the Amazon site at the time of purchase will apply to the purchase of this product. Choo-choo-choo, here comes the little boat train. All aboard this set of six boats that link together to make a train of tub time fun. Whether your little one loves to play with vehicles (trains, boats, or both), loves to link and build, or just loves to zoom things through water, these bath toys are sure to be a hit. The boats float, scoop and strain water, and are designed with goofy faces guaranteed to make your little one smile. 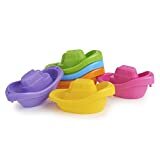 Each pack comes with six brightly colored boats numbered 1-2-3, making them great for teaching colors, order, number recognition and counting. Linking, scooping and pouring help develop fine motor skills, too. Your little captain/conductor is in for a fleet treat.